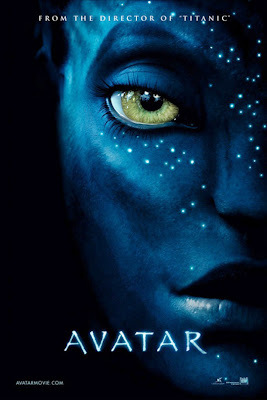 ...and Avatar in 3D rocks even better. We've waited for weeks to watch this movie. It was MMFF season so most of December is all about Filipino movies. Not that it's bad--some Filipino movies are also great. But I was really excited to catch this film in theater coz as I've heard the effects are awesome. So today me and Mich, ate and miles, and joot and kang went to SM-Marikina to watch it in 3D. Yes, there's 3D in SM-Marikina. Cool eh? :P And what can I say. We were not disappointed. We even said we'd watch it again! Clint, told ya the girl is not Angeline Jolie! It's Zoe Saldana! Hahaha. View the summary and synopsis here in IMBD. So for those who haven't seen it--GO na!!! P.S. 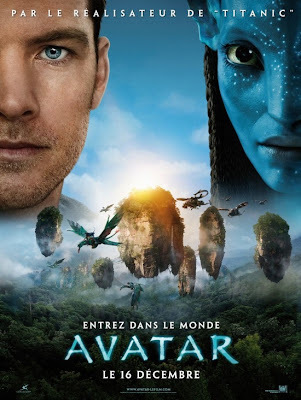 And don't you just love the French version of the poster. Sooo jurassic park meet the aliens. Loves. Here's what my sister and I wore to the movies--and some of our chipmunk friends!